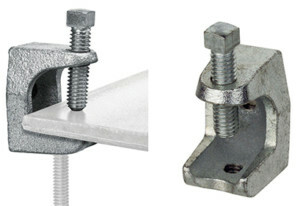 Beam Clamp is an alternative method to the traditional methods of steel connection which are welding or drilling. 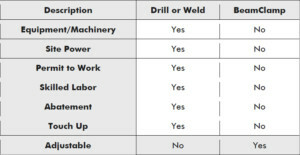 The following charts and tables are designed to show the differences in all the methods and to highlight the reasons why BeamClamp is becoming the preffered option for safety, cost and practicality. Welding steel is a traditional method for joining steel and is an economical way of doing so when this can be done off site in a shop before the steel arrives on site. This is generally the preferred method for most primary steel structures which are fabricated with pre-drilled holes that are then bolted together on site. 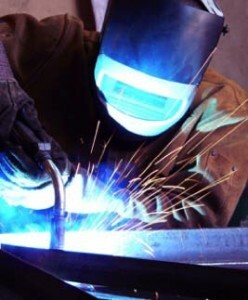 The main issue with welding is when additional steelwork is required to be connected to the main structure. Welding requires expensive equipment, it requires expensive skilled labour and the quality of the weld is down to the skill of the welder. The connection is also permanent once it is made and does not allow for on site adjustment or for temporary works. If the existing steel has a protective coating such as hot dip galvanising or paint this will need to be removed before the connection can be made, this will then need re-coating afterwards. Welding also creates heat and sparks that can be dangerous in any hazardous environments also meaning that hot work permits need to be applied for and provisions for fire watches post the completion of the work until it cools down. 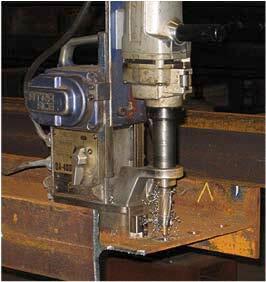 Drilling and bolting like welding is a very common and traditional method of joining steel together. This is also economical and easy to do when the steel has been pre-drilled off site and then assembled on site. This is a perfect solution for most primary steel structures where the design allows for off site fabrication. When an unplanned or later addition to the main steel frame is required this becomes more problematic. To drill steel on site this requires heavy duty drilling equipment and power along with skilled labour. When drilling the existing steel it may have a protective coating that needs to be broken and also by inserting holes in to the steel it will mean the integrity of the steel has changed from its original design. Once the holes are made it is also difficult to make fine adjustments on site to the position of the steel without making new holes. Drilling through thick steel sections can become costly and time consuming as standard drilling speeds need to be adhered to and the drill bits themselves wear out quickly and are costly to replace.